Gary Stewart: You wrote in your book, Kossoh Town Boy, “I wonder what my father, or my mother, were they alive today, would say of this boy of theirs? Has he grown big in realization of their dreams? Or has he merely accumulated years?” I’m wondering after 80 years now, what do you think your parents would think of this boy of theirs? Robert Wellesley Cole: I think they would be more than satisfied, especially when I compare myself with others. One thing that I realized and made my motto was that my parents devoted almost all they could afford to educate me, and I, in turn, educated all my brothers and sisters. That’s all parents can do for their children, give them education right to the top. G.S. : Your father was an engineer with a responsible position. Was it unusual to have an educated father in those days? R.W.C. : No, the education was not unusual. But they [Africans] were never appointed [to positions of authority]. All the educated appointees were whites. I’ll give you an idea. A college mate of mine came over to Oxford and got a degree in agriculture. His home was the Gold Coast [today’s Ghana]. He went home and applied for an appointment in the Gold Coast government in agriculture. All they could offer him was a third grade clerk, and this was with a BA from 0xford. G.S. : Did others of your classmates, though, were their parents educated, or was it rare? R.W.C. : Oh no! Sierra Leone, I wrote about the Krios of Sierra Leone. They are quite different from all other Africans. They are just about 20 to 100 thousand, not more. But the point was that first of all they were a settler community and the conditions on which they were admitted were they were free, they had to be free to come in. And then they were attached to villages which were under missionaries, they were like parishes, and each of those villages had schools. Besides, the Nova Scotians, who were the American blacks, all came with a fervor for education. G.S. : Your own education was pretty amazing to me. You talk in your book about studying Latin and Greek early on. Was that typical of schools in Freetown? R.W.C. : In Freetown yes. Freetown was the only place. The other colony villages had primary schools but the secondary schools were in Freetown. They would have to go from say Waterloo, Regent, and so on, to the Grammar School, High School, or whatever. But the thing was, it was a disgrace for a Krio child not to be able to read the bible and psalms and to write his name. That is why they were the clerks for the whole of the west coast right down to Sao Tome and Angola when the cable and wireless came. R.W.C. : We were not separate; there was a very close link....The only thing was we [Krios] had a feeling of superiority. We were the elite. But, we did not look down on them as a whole. We employed them. My father had four hammock boys; he went to work on a hammock. People from upland would bring their children and say, "Misis a kam gi yu, mek yu tren am fo wi." [Madam, I’m going to entrust (my child) to you; bring him up properly for us.] All the Krios did that. And our people went upland as traders before the Lebanese came. G.S. : Your first wife was a white woman. An interracial marriage was fairly radical for the 1930s. Did you feel the effects of any racism? R.W.C. : No, no, no, there was no racism at all. In fact, in Africa where the white man was in a sort of command, there was no racism at all. One advantage was the Krios, the Colony, were British. We had all the advantages which the Protectorate didn’t have. We could come to England. We could go to any part of the empire. We spoke English at school; all the education was in English. And all the examinations were in English set by London, Cambridge, and Oxford. So we didn’t feel strange at all. What was more, we were better educated than the white civil servants who came out....I think at most about four were university people. Among the Krios we didn’t look down on the white man, but we didn’t look up to them. G.S. : Do you think racism was a factor in the denial of the residency appointment in Newcastle you were trying to get back in 1934? R.W.C. : Oh well that’s different. That is different. This word “racism,” I know what it means and yet I don’t accept it. You see I was blocked at every point, but at no point did I feel inferior or that I was blocked for my color. G.S. : You didn’t feel you were blocked because of your color? R.W.C. : No, I felt I was blocked because they were jealous, because I was beating them and they hated the idea of a black chap doing that. G.S. : But had you been white, it probably wouldn’t have been the same. R.W.C. : Oh God, if I had been white!...I would have just gone straight on....When I talk about color and racism I cannot accept the inference of inferiority from any mortal. My motto is Cicero’s words: “Miterent dum timerent,” let them hate so long as they fear. G.S. : Can you explain your latest project, what you are working on now? R.W.C. : Oh yes, all I’m doing now is just to write out my autobiography [An Innocent in Britain]. You see my basic qualification is surgery. I’m not a writer, although I’ve written, but I look upon myself as a doctor and a surgeon. And also I have done an awful lot of social work for our people. I was about the only one [African] resident in comfortable circumstances in England all during the war and after. So that I was on all the committees that the Colonial Office established to look after colonial people and colonial affairs. There was a welfare committee; there was a medical committee; and the economic and development committee. I was the only African there....What I want to do is to recall these things so that it becomes part of our history that these things did happen. G.S. : You have stated in the past that the Krios have been the spearhead of western modern civilization in Africa. There are people who would argue that the continent would have been better off left alone without the white man and his civilization. How do you feel about that? R.W.C. : The continent had already had five centuries of the white man or at least three to four. You see this was God taking pity on the continent and saying, well look, it is one world, you have to get used to the rest of it which is controlled by western civilization. So instead of the relationship being one of exploitation let it be a question of self-help and self-development. And the only way to do that is for you to get to understand the language and points of view and background of the white man....You people [whites] are not given sufficient credit you know. They keep talking about Nova Scotians. The Nova Scotians were not Nova Scotians, they were American blacks you see. They really brought civilization to West Africa when they came in 1791, 1792....The British did not add much to that. The British just came to farm the country. Whatever is there worth-while, take it away, that sort of thing. They didn’t even introduce one technical school or college there; it was the missionaries who did. G.S. : What do you think of the missionaries and Christianity in general? Has it been a good thing for Africa or a bad thing? R.W.C. : Oh no, it’s good, it’s a good thing, not a perfect thing, it’s a human thing, but it’s good. If they hadn’t gone there we would have been just left like that you know. It’s a good thing. They were very conceited people, and everything the African had was bad, you know....Fortunately the Africans were able to catch up quickly. G.S. : Isn’t that sort of a destructive thing, though, when somebody from another country comes in and begins to tell you everything that you’re doing is bad? You’re worshiping the wrong gods and you’re using the wrong music in your worship? R.W.C. : Well if you want to say it, it’s perfectly destructive, but you don’t die. You evolve your own adaptation of the situation....In our case we were not killed. At least physically we were all right. But we had to have standards, you see, and it has made us. One thing it has done, it means that we can move anywhere in the world and we will feel equal to the rest of the people. There is no language anybody in America or France or England can talk that we don’t understand, you know what I mean? We’ve got the background. I think it’s a very great contribution. G.S. : What were your years of service in Africa like, two years in Nigeria and ten in Sierra Leone? R.W.C. : Oh, they were wonderful....I got to Nigeria when I went to visit my sister who married a Nigerian. Now we were all independent, I went in ‘60, we had just gotten independence, and they interviewed me. The next morning the head of the civil service, now a Nigerian, sent for me. He invited me to come over. So I said well look I am both a surgeon and a physician but between you and me I prefer to be a physician....So they gave me a contract to go out for seven years, five tours, with all expatriate benefits as Senior Specialist Physician....I was there for two years and then, while I was there, [Sir Milton] Margai who was then Prime Minister [of Sierra Leone], we met in London when I came on leave and he said, “Well you know doctor you are a Sierra Leonean and we need you.” So I had to give up my appointment in Nigeria and went to Sierra Leone....It stated that my appointment was outside the civil service and that is why I was consultant to the government. But also I had my own clinics, and there I did both general surgery and ophthalmology for ten years. G.S. : Why did you decide to leave and go back to England? R.W.C. : Well I was kicked out politically. R.W.C. 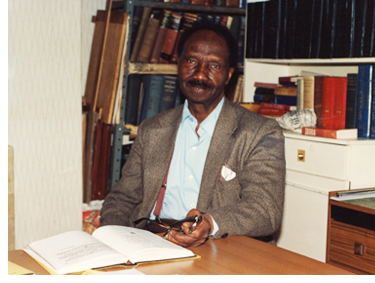 : Siaka Stevens. I just used the word kicked out, I was never kicked out. But the position was, I had an open invitation to go out [to Sierra Leone] you see. They wanted me to go out and stay as long and sort of retire. There was no retirement age. As I told you I was outside the civil service, I was 57 whereas the civil service stopped at 55. It was just a shock when one day I received a letter addressed, instead of to Consultant Surgeon, to Temporary Consultant Surgeon....Then I opened this letter and they thanked me for all the work I had done. It was a really lovely letter, but they gave me a month’s notice. I wrote directly to the president himself....I said, “I came fully intending to stay as long as my country wanted me. Now that you don’t want me, please return me and my family back home, and my home is England, that’s where I’ve been since 1928. And also at my level I need at least six months’ notice; you can’t just give me a month’s notice.” So he wrote back and arranged for all of us in my family to come over [to England] in first class fare and my notice was extended to two months....The reason I found later on was the chap whom I met there [a doctor in the top civil service position], he was due to be 55 at that time and that would mean him going out, no job to do. Well the obvious thing was to try and get Wellesley out so he could move into that, which he did and I came back here....I did not mind, my interests were in England. G.S. : What prompted you to write Kossoh Town Boy back in the late ‘50s? R.W.C. : Because my nephews, I had no children then, my nephews were all cocky you know. Youngsters think that the world is theirs. So I had to write that to let them know that I too was a boy. G.S. : A few years ago you wrote a series of articles for West Africa on Krio. Has Krio evolved considerably over the years from when you were born and started speaking it? R.W.C. : Oh yes, oh yes. Krio is a wonderful language....It is not a pidgin at all. It is a language; it’s just English in African diction. But I found that the Latin that I learned, the declensions, the conjugations and all these various things could be found in Krio. Of course the words, the dictionary, that varies, but the syntax is Latin-Greek syntax. And the reason for that was that the only literature the Krios had was the bible. That was the only thing. And the bible is just the Anglo-Saxon, Latin combined. G.S. : So it isn’t really accurate to say that the grammar follows indigenous African languages then. The grammar did not come from there? R.W.C. : No, I’ve just been saying the Krios were not really so mixed with the natives, with the Africans. The Krios are people who have left their roots. G.S. : What do you think of the Krio-English dictionary [A Krio-English Dictionary, compiled by Clifford N. Fyle and Eldred D. Jones, Oxford University Press, 1980]? Have you seen that? R.W.C. : Oh yes, I’ve got a copy and I’m very grateful for it, oh very grateful for it. G.S. : You conclude Kossoh Town Boy, “All I know is that one day I woke up to find that that cocoon of a boy with which we started at Kossoh Town was gone. When it happened I do not know. But I am glad to have been that boy.” Do you still feel that way after 80 years; are you still glad to have been that boy? R.W.C. : Ah yes, Ah yes. I’ve had a wonderful time you know. Had a wonderful time.